We're working very hard to make sure your visits are convenient, comfortable, and gentle. To that end, we investigate all of the latest technologies and techniques. Highly recognized as a greatly progressive disorder, periodontal disease is triggered by preventable factors, like plaque buildup, tobacco use, certain medications, and stress, as well as unpreventable causes, like systemic disease and fluctuating hormone levels during puberty, pregnancy, or menopause. 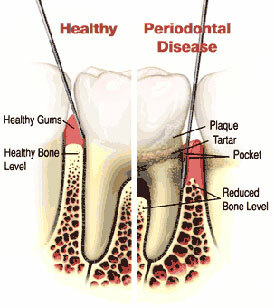 Research proves up to 30 percent of the population may be genetically susceptible to gum disease. Restorative and aesthetic procedures can be combined to create a smile that’s perfect for you. For instance, cracked, chipped, or unevenly spaced teeth can be made to look fresh and new with bonding or veneers. In fact, your dentist can even reshape your front teeth to create the smile you’ve always wanted. Crowns can restore function and beauty to unstable teeth, and all-porcelain crowns leave no dark lines at the gum, so your smile will maintain an all-white, natural beauty. Bridges or implants can replace missing teeth and restore the underlying structure that makes your face full and youthful. These dental procedures will not only give you a more beautiful smile, but they will also restore full oral function, as well as your self confidence. We’re rough on our teeth. How many times have you chewed on ice or played sports without wearing a mouthguard? If you also skip semi-annual dental appointments and neglect a rigid homecare regimen of brushing and flossing, you compromise your smile even further. People damage or lose teeth every day from injury, disease, or decay. A damaged tooth can destroy oral function and cause pain, and a missing tooth will leave a gap in your smile. Your mouth must compensate for the lack of chewing power when a tooth is missing, so the chewing force may move to another part of the mouth. This causes the remaining teeth to shift out of place and further destroys your smile. A bridge can actually replace missing teeth. Fused between two porcelain crowns, a bridge can replace one or more teeth to complete your smile. If you prefer a more stable and long-lasting prosthetic, a dental implant may be the right choice. Dental implants closely mimic nature in that they start with a firm foundation – a titanium post inserted into the missing tooth’s socket. This post creates a prosthetic tooth root that bonds with natural bone tissue. On top of the implant, we can place a beautiful prosthetic tooth, a dental implant restoration, that will look, feel, and function just like your natural teeth. The moral of the story is to be nice to your teeth, be diligent with your oral hygiene, and visit your dentist regularly. Your teeth are hard workers, but they’re also a precious part of your body that you should care for and respect. However, if the damage is already done, see us immediately. We can help you decide on the best treatment to restore your smile. Your teeth will thank you for it.